The CLion is a cross-platform C/C++ IDE for Linux, OS X, and Windows integrated with the CMake build system. The initial version will support the GCC and Clang compilers and GDB debugger. 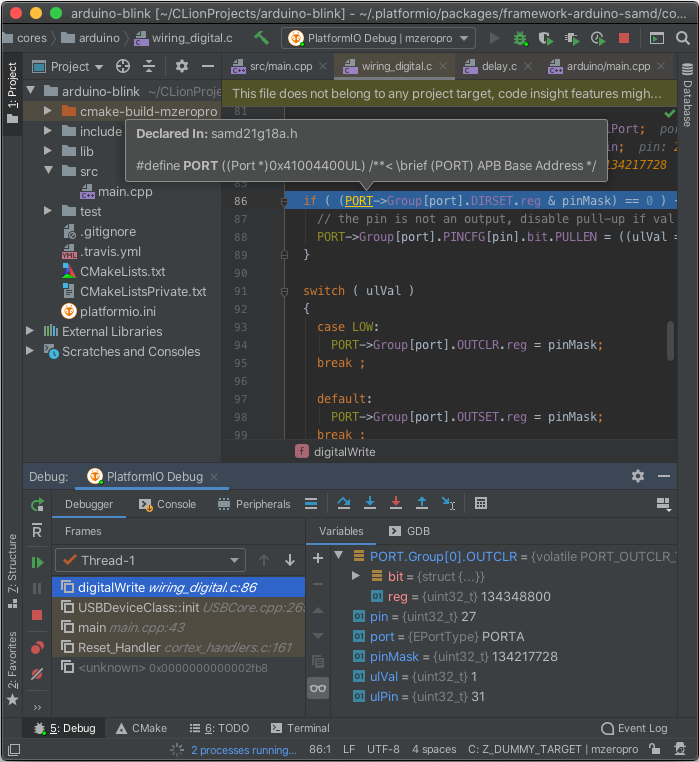 Clion includes such features as a smart editor, code quality assurance, automated refactorings, project manager, integrated version control systems. Refer to the CLion Documentation page for more detailed information. Build project (DO NOT use “Run” button, see marks on the screenshot above): Menu: Run > Build. PlatformIO Core (CLI) DOES NOT depend on Cmake, it has own cross-platform Build System. All data related to build flags and source code filtering should be specified using Build options in “platformio.ini” (Project Configuration File). 2. See know issue: Arduino .ino files are not supported and how to resolve it. PLATFORMIO_REBUILD_PROJECT_INDEX - Rebuild C/C++ Index for the Project. Allows one to fix code completion and code linting issues. The libraries which are added, installed or used in the project after generating process will not be reflected in IDE. To fix it please run PLATFORMIO_REBUILD_PROJECT_INDEX target. See how to Convert Arduino file to C++ manually. See more Articles about us.